Last week we wrote about the importance of storing water and just how much you might need. As promised, this week we follow up with some great ways to store water. Storing water might sound simple but you have to consider the source, container, purification, the weight of the water, space that is needed and more. Here are some things to consider when building your water supply. There is a wide selection of containers for water storage available with a wide range of volumes and costs. 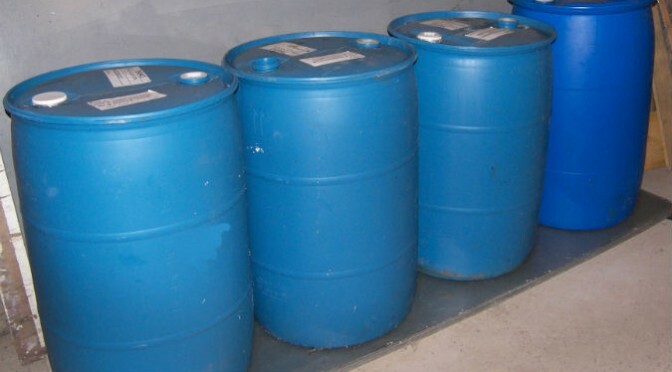 When we talk about water barrels the blue 55 gallon drum is the first thing that often comes to mind. New barrels can range from $50 to $75 plus shipping. However you may be able to find “similar” barrels from your local soda bottler used to store soda syrup for as little as $10 but they will need to be cleaned and may have an “aftertaste”. There are larger containers available (up to several hundred gallons) with costs between $1-3 per gallon plus shipping. Smaller containers can provide a portable low cost option can be obtained over time. You can reuse soda or juice bottles for water storage after they have been cleaned properly (hot water and dish soap followed by lots of rinsing). Be sure that the caps are clean and that they can provide a good seal to keep the water clean and safely in the bottle. Two drops of bleach can be added for each gallon of water to maintain quality in storage, but be sure there are no perfumes, dyes, or other additives are in the bleach. Never reuse a container that held toxic substances such as pesticides, chemicals or oil. When filling water containers always use water from a safe source. Only use food grade storage containers. Once the containers are filled you should plan to replace the water every 6 month. 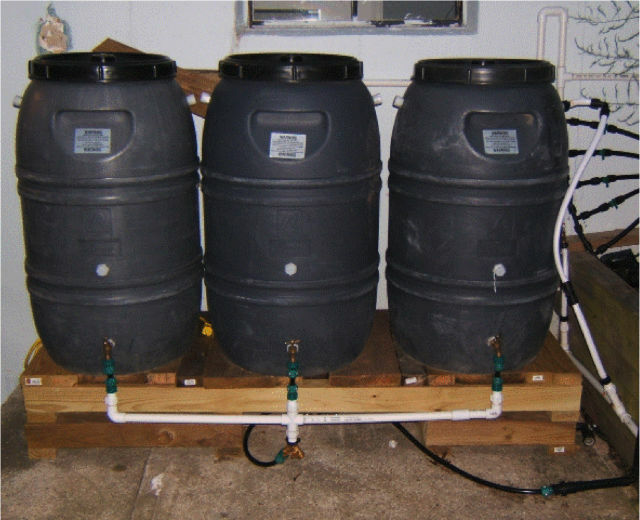 When planning a water storage system you need consider the weight (water weighs 8 lbs per gallon) and include a plan to fill, empty (don’t forget the pump), and refill barrels in a safe, efficient manner. When planning your water storage system in areas that have cold winters remember to avoid freezing as it will split the barrels and soak your storage area. Most municipal water systems rely on a water tower fed by a pump to provide the water pressure for residential use. The water level in the tower will drop over the course of the day as consumption exceeds the supply being provided by the pump, and then overnight the pump will refill the water tower to its maximum level. This is why you often find that you have better water pressure in the morning, than late in the afternoon. 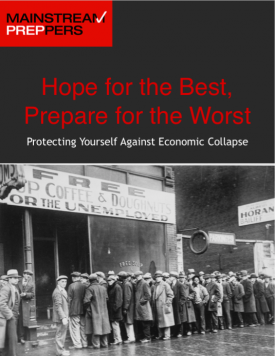 The reason why this is being discussed is that even after a disaster resulting in massive power outages. There is a period of time when the water in the tower can provide drinking water to your home. The time you have available to take advantage of this design can vary greatly depending on if the municipal water system has a backup power supply for their water pumps, the time of day, and whether or not your experience a drought condition. Regardless of the condition you have an opportunity to top off your water supplies before the water tower runs dry. During this time the typical faucet could provide as much is 5 gallons per minute. So assuming you have three hours before the water tower runs dry, you can collect an additional 900 gallons of water for your emergency stores. Remember that clean food storage buckets, clean ice chests, clean water jugs, even clean empty canning jars could be used to store life-saving emergency water. No matter how much water you have stored eventually you will need to replace it and if there is no running water you will need to have a plan to provide a sustainable source of water. Possible sources of sustainable water include wells, rivers and streams, natural springs, lakes, ponds and rainwater. If you live in an area where there are regular rain events (every 1-2 weeks) a rainwater collection system may be a good option. A common approach is to divert water from a rooftop downspout into a collection system attached to a line leading to a set of water storage containers. Be sure to include a screen before the downspout to keep leaves out, and a trap (with a cleanout port) in the feed line to keep sand and grit out of your water containers. A rule of thumb when planning a rain water collection system is that each square foot of collection area will produce 0.63 gallons of water per inch of rain. When making a rainwater collection system always plan for a way to extract the water and account for overflow when collection containers are full. Don’t forget that at 8 lbs. per gallon even a small collection must be well supported. The system in the picture below could hold up to 195 gallons and weighed over 1500 lbs when full. With a 15’X50′ collection area, it takes less than 1/2” of rain to completely fill these storage containers. The system shown has an electric water pump mounted below the barrel platform to provide water pressure to the nearby garden irrigation system. When planning a rainwater collection system in northern climates, you must have a way to empty all the lines and containers to avoid rupture due to freezing water. Remember, when collecting water from these sources the water must always be filtered and purified before drinking. Water can be filtered using paper towels, cheese cloth, cotton cloth, or coffee filters and a funnel. Once the water is filtered it should be boiled for at least one full minute and then allowed to cool. 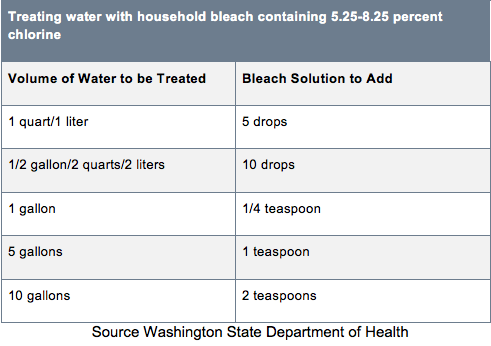 Two drops of bleach can be added to each gallon of water to maintain quality, let stand for one hour before drinking. Another approach to water purification is to use a submicron filter to provide a method of producing clean drinking water. Water filtration systems can cost from $20 to several hundred dollars based on the capacity and technology used. These systems can be extremely portable and can be used to filter hundred or even thousands of gallons of drinking water. you say 2 drops to the gallon in the beginning of paragraph 5 but the table says 5 drops for 1 quart/liter. Which should i use? I suspect the difference is in the type of water you are starting with. If from the tap and you want to store it, use the first number. If you drawing from a stream and want to kill the bugs, you need more.